James Pettit, CEO of Aben Resources, sits down with Maurice Jackson of Proven and Probable to discuss his company's exploration program where the first hole at the Golden Triangle project revealed off-the-charts gold mineralization. Maurice Jackson: Joining us today is James Pettit, the president, CEO and director of Aben Resources Ltd. (ABN:TSX.V; ABNAF:OTCQB). Mr. Pettit, for someone new to the story, who is Aben Resources and what is the thesis you're attempting to prove? 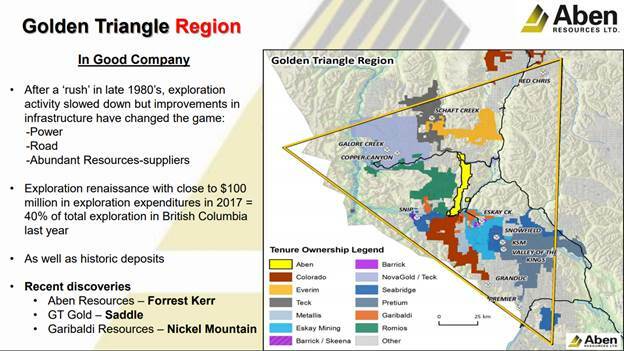 James Pettit: Aben is a junior gold exploration company located in Western Canada. We have three projects underway. The primary focus of the company is in the Golden Triangle in northwestern British Columbia. It's called the Forrest Kerr Project. We just put out some pretty gangbuster assays on our first hole of 2018, so it's a very good start. We've also have project in northern Saskatchewan called the Chico Project, and in the Yukon, right next to Golden Predator, we have another interesting gold project called the Justin Project. Maurice Jackson: Let's discuss your three projects. Beginning with your flagship project Forest Kerr, which is approximately 23,000 hectares, what type of lithology is prevalent there? James Pettit: The size of the property being very long and narrow, it's 40 kilometers long, probably 10 kilometers wide. It encompasses 23,000 hectares. The reason it's shaped the way it is because we acquired land that is right along a massive structural feature, which is right in the heart of the Golden Triangle. It's called the Curve Fault, and that acts in our minds as an engine for a lot of what has been discovered there over the last three decades. That's where potentially a lot of the fluids come in off these subs plays. It's prime location, took almost a year to acquire these three different properties and we're earning a 100% in the three that incorporate that whole land package. Maurice Jackson: Aben already has historical data on the Forrest Kerr project. Is that correct? James Pettit: Lots! Each one of those properties came with a treasure chest full of past historical data because there's been a couple of cycles up there. The early initial discoveries of Snip and Eskay back in the 1990s. The infrastructure has drastically improved in the last three, four years, which is fantastic because we now have new access to the following: a massive power generating plant on the Iskut River, which is at the south end of our property, which is a massive generating system. A highway runs right up beside the whole region and Highway 37 goes all the way up to Yukon and Alaska. It's all paved now. Then we have access in the northern part of our project property, Galore Creek Road heading to the Galore Creek Mine, which looks like it could get new life because Newmont's now invested in it. The south side is the access road into the Alta Gas Power Project. Maurice Jackson: What you just shared with us ties into my next question. 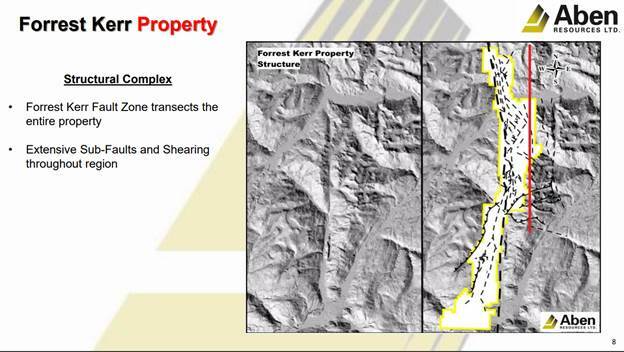 Who initially conducted the initial drilling at Forrest Kerr and after that initial data was collected, why did the drilling stop? James Pettit: This area has experienced three waves of exploration. The initial discovery would have been back in the days of this famous or infamous mining promoter, Murray Pezim, with one of his companies; Ron Netolitzky, who's my chairman, he coincidently ran that company. He discovered Snip and was involved in the discovery of Eskay Creek back in those days. Things ended very quickly because the price of gold collapsed. Then again you've got another resurrection in gold, interest starts again up there. It falls out of favor again for the same reason, not necessarily about gold. It could be any reason, but the high risk venture market took a downturn and people just left their shovels and blades and walked away. Now we come back the Eskay; it is shut down. Snip is now being resurrected by another company of Ron Netolitzky's. There's more exploration work going on around Eskay Creek. You've now got Imperial Metals' Red Chris Mine right up in the north corner of the Golden Triangle. That's a big copper project that's now in production. In addition, there is Pretium with Brucejack project south of us. Brucejack is a really high grade, big project. Plus, more discoveries are being made. There's some pretty good discoveries being made last year consummating probably the biggest year of exploration up there. Garibaldi has come out with a nickel discovery. GT Gold near the Red Chris Mine is working on a project that has been turning out some pretty good numbers. I think pretty soon it will have a good looking resource. Then what Aben Resources has found is just amazing; it's probably the highest grades we've seen in western Canada in decades in a one hole. That zone we've hit had three of our holes from last year. That's what brought us back this year and is basically confirming it. Now, we're trying to get a handle on the orientation of it and the structure, which just means we've got to drill more holes around it to expand on it. Maurice Jackson: Interesting to note, and I want to commend the geological and technical acumen of Aben Resources team here. You've reviewed the historical data and recently commenced a drilling program. Aben just released really some fascinating assays. What can you share with us?